Palm Sunday marks the Catholic Church’s annual celebrations of the World Youth Day. While not as glamorous as the mega gatherings held every few years, this day is intended to celebrate the young church around the world at the local level. One does not need to have money for a plane ticket, time to take off of work, and a visa for a foreign country (all difficulties for most young Catholics in the world) to celebrate this youth day. In his message for the 2012 celebrations, Benedict offers a theological reflection on joy and the special role of young people in the church’s vocation to “bring joy to the world.” Young people, he writes, are called to look to God as their source of joy and to respond to this gift through acts of love, generosity, communion, and service to the common good. For this World Youth Day, I had the honor of celebrating Palm Sunday with the national leadership of the National Catholic Student Coalition. Meeting at St. Thomas Seminary in Hartford, CT, I had the privilege to spend the weekend with a dynamic group of young apostles as they planed how better to serve students across the country. Witnessing the joy in these young leaders, I was struck by two things: a real desire to become engaged in the church, on the one hand, and the lack of resources to do so, on the other. I was deeply impressed by the real longing of these students to serve the church and deepen their relationships with God and others. Amidst their busy academic and social schedules, these young Catholics have answered the call to become involved in the leadership of the “student church.” Unlike those of us privileged to be at schools like Boston College or Notre Dame, most young adults do not have access to college theology classes and highly funded campus ministries with multiple retreats and service projects. Sadly the majority of college campuses in the United States (72%) do not have any Catholic student group or campus ministry. Most college students in the United States do not have easy access to the rich Catholic tradition, its sacramental vision and its teaching on social justice and peace. Many are left to find information about Catholic teaching from the (untrustworthy) internet and local parishes without any targeted outreach to students. Given the critical role played by campus groups in forming the overall leadership of the church how can we afford to ignore the pastoral needs of these students? For students, this means that the Church is called to support and strengthen Catholic student clubs and ministries that seek to aid students in finding joy with one another and empower them to witness to that joy through service and social action. While some new groups with a strong evangelical missions have developed in recent years to fill this void, experience shows us that the most effective forms of ministry are those that seek to develop a holistic or integral approach that takes into account the six aspects of campus ministry highlighted by the US Bishops. In order to be agents of joy as Pope Benedict XVI teaches, young adult Catholics need communities that can assist them to integrate their studies, personal relationships and actions for justice with their faith. In order for this to happen we need a serious rethinking and renewal of our approach to the student church that takes seriously the multiple dimensions of student life and empowers them to live out their faith in action. In his letter, Pope Benedict highlights the model of Pier Giorgio Frassati (1901-1925) as a witness of hope and joy. Frassati is indeed a model of someone who integrated his faith life with his personal relationships and his commitments to social justice and peace. This commitment came, in part, from his membership and leadership experience in the Italian Catholic Student Federation (FUCI) and his role as a member of the founding generation of NCSC and FUCI’s international family, the International Movement of Catholic Students (Pax Romana). For Frassati, there was a deep connection between his Christian faith, his studies, and his concerns for social action. His faith was not defined by a narrow definition of evangelization or a self-centered understanding communion. Instead, the young saint witnessed to an integral vision of empowered discipleship. As church, we cannot ignore the challenge of offering such a Gospel-based vision to all students. Groups like the NCSC can go a long way in helping to make this happen but as student-led movements they need support and help from non-students to make that happen. 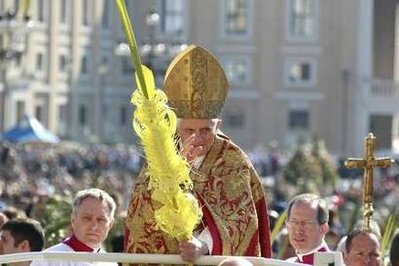 On this Palm Sunday, as we begin the celebrations of Holy Week, the pope offers us an important reminder of the role of joy in Christian life, which seems very important today. The contemporary world is filled with many sufferings. The reality of the cross that we hear about in the passion narrative remains real to so many people, especially young people, around the world. Nevertheless, as Christians we have hope in the Good News of the Resurrection. With the assistance of the Holy Spirit and vibrant communities, this hope can help us all to become agents of joy in the world.